Some of my favourite things in life contain the word express; American Express, McDonalds Express and the Heathrow Express, now comes an iteration of Pro Tools with the same name, Pro Tools Express. Unlike some of the aforementioned, it’s not denoting the speed at which one can do something, more the product position, let me explain. It wasn’t long ago when you could buy Digidesign, or more recently, Avid hardware and get a free copy of Pro Tools, however, no-one seemed to be happy and everyone complained that they would rather buy the software and not have to buy the hardware. So in the end a ‘new open Avid’ relented and Pro Tools 9 marked a new era for Pro Tools, a hardware free era. Now you could have the joy of Pro Tools software without the need to buy the hardware. Now everyone was happy (cue screeching brakes sound effect). Well, of course what Avid proved when they gave people what they wanted, was that some people are never happy. There was now a group of people who still wanted to buy Avid hardware and get a free copy of Pro Tools software. So the accommodating Avid have taken a bold step, to now offer a new version of Pro Tools, Pro Tools Express, free with every Mbox and Mbox Mini. Now there may be some of you thinking, like I did, haven’t we been here before? Well, yes and no. If you want a quick history of Pro Tools iterations (one can’t help think there’s someone at Avid employed just to come up with these monikers) we’ve had; Pro Tools, Pro Tools HD, Pro Tools LE, Pro Tools M-Powered, Pro Tools Essentials, Pro Tools SE, Pro Tools 9, are you keeping up? Not forgetting Pro Tools FREE. So no one can be blamed for thinking this is a little like de-ja-vue. However Pro Tools Express is different from the other versions in the fact that the only difference between Pro Tools Express and the regular version is a limited track count and a few less plug-ins. Other than that, what you get with Pro Tools Express is Pro Tools 10 free with an Mbox or Mbox Mini. It is tied to the Mbox and also requires an iLok, so you can’t use this version of Pro Tools with any other interface, or no interface for that matter. Even better the pricing for the bundles is aggressive. How aggressive? Well in my opinion ‘competitors sh*tting themselves’ aggressive. In some cases, as of today you should find both Mbox units at the same or less than they were, but now with Pro Tools Express. So that’s the new Mbox with a slightly less powerful version of Pro Tools 10 for less than $500! That’s a steal when you consider that the current Mbox is selling at Sweetwater for $449 and the Mini $269. 16 busses and a master. You get Automatic Delay Compensation, Soundcloud, iTunes and all the other bounce features. The sessions are fully compatible with other Pro Tools sessions. You get Rewire so you can bolt on Reason, Sibelius or REAPER. So for 99% of the time, a person buying an Mbox, say a singer songwriter, home musician or person playing and recording their garage band, is going to have everything they need to make great music with Pro Tools. If they find themselves running out of stuff, then there’s upgrade option to the full version for $399. Now I know there’s going to be some people (normally those with too much time on their hands, who trawl around forums all day) kicking off and declaring that it doesn’t have the features of Pro Tools HDX. They are right, it has some limitations, there’s no record deal thrown in, Ferrari, or trip to Vegas. What do they expect? It’s a free copy of Pro Tools, which is perfect for the people it is aimed at, we would all like the aforementioned for free, but perhaps we also need to be a bit more realistic. If you buy a Mac Mini you don’t get the card slots or the extra drive bays of a Mac Pro, don’t expect to go into Burger King and get dinner at the Ritz, just as Pro Tools HD is aimed at a different market who want to pay more for the extras. In the past I could agree with some of the criticism of Avid for their decisions and some pricing policies, but on this one, I’m going to fight their corner. If you want to suggest you should get the same features as those investing in an HD or HDX system, then may I respectively suggest you stop being so dumb, that would be neither practical or fair. However there is one thing I don’t agree with Avid on, the name. I was reminded by one of the Avid team last week that they were the first to come up with the name Express, with Avid Express. Perhaps they were, but I think the name does the product a disservice - had I been asked (and I think it’s damned rude that they didn’t ask me), then I would have come up with something else, perhaps even Pro Tools Ex, but as Shakespeare once wrote ‘What’s in a name? that which we call a rose by any other name would smell as sweet.’ So this is the worst thing I can say about this product, the name in my opinion may be a little ropey, if not dated, but it still doesn’t take away the fact that this is a great bundle. As to the issue of the missing plug-ins, if you have a friend with the regular version of Pro Tools, if they give you the .dpm files of the missing plug-ins, then they will work in Pro Tools. It does seem a little silly to withhold some of the plug-ins, especially when you can get them from a friend and install them yourself. I think Avid should rethink this and give people an opportunity to download from Avid officially. As, I say that’s not a complaint in as much an observation on a piece of thinking that doesn’t seem very joined up. In terms of a review, there’s not much more to say, you can head over to YouTube to see my video review of the Pro Tools Express, but if you’ve seen Pro Tools 10, then you’ve seen Pro Tools Express. This is the first time I’ve had my hands on an Mbox and it’s a great interface, great sounding, some cool features and as I’ve said in the past, it’s built like a bomb shelter. The whole bundle is a great deal, in fact the price is so good for the Mbox and Pro Tools Express bundle, it’s going to be a winner. Granted there may be some features missing like Clip Gain and Beat Detective, but for those users this pachage is aimed at, it shouldn’t be a deal breaker. So, although we expect hate mail for being so positive about Avid (no we still don’t work for them!) 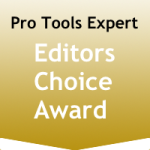 The whole Pro Tools Expert team think this is a great deal, so I’m going to give the Mbox Pro Tools Express package my Editors Choice Award - it’s a no-brainer for someone wanting to get Pro Tools hardware and software at a knock-out price!